Even in an apartment or rental, you can grow strawberries in containers on your deck or patio. Growing strawberries in containers on my deck makes maintenance and harvest convenient and easy, keeps them away from most pests, and eliminates the need to dig up even more of my yard. Before tree roots robbed me of my sunny garden spot, I had plenty of space for a big bed of strawberries. As I have reorganized my gardens and slowly added new bed, I still didn’t have room for strawberries and I have really missed them! So the annuals on the deck are getting the boot to make room for strawberries. I made three colorful deep crates for flowers on the deck last year, they will be great for the strawberries. Plenty of soil to help keep the moist and convenient to the kitchen for maintenance and harvest. There are several strawberry varieties that do well in containers or hanging baskets but really you could plant any variety in a container. June Bearing strawberries produce a spring crop, but I personally would prefer to grow those in the ground. The plants send out runners that produce new plants, which works great for an in ground garden, but not so great in containers. Each year new plants establish to replace old plants that have reduced production. If you want to try them in a container choose a large wide container such as a half whiskey barrel. Position plants around the outer edge so they have room to trail over the edge and set runners into the center. Day Neutral strawberries produce all season long. The berries are smaller but you get a constant supply. They also require little in the way of maintenance to keep production going. Alpine strawberries produce tiny sweet strawberries all season. The plant will slowly spread and work very well for containers. They also produce well in part shade. Choose a container that allows horizontal space for your strawberries, but it does not have to be deep since strawberries have shallow roots. Minimum depth should be 6 inches, but deeper soil will not dry out as quickly. And since strawberries like as much sun as you can give them, all day sun will tend to dry the soil out. In a 14” wide container you can plant 4 or 5 strawberry plants. Make sure you get good drainage, strawberries do not like wet soil but they do love to get watered regularly. Place your containers in a sunny spot. Your strawberries will reward you if they get all day sun, but with a bare minimum of 6 hours sun you should still get good production. Then fill your container or hanging basket with a light growing medium. Unless you are experienced at mixing your own potting soil, use a prepared potting soil for best results. Potting soils are formulated to be light and aerated, and hold moisture but still allow good drainage. Soil absorbing crystals, available at garden centers, can be added to the soil to help retain moisture. If you have a good fluffy, well aged leaf mold compost, you could add a scoopfull to the container. Strawberries do demand good soil nutrition, and ideal pH is very neutral. Plant your strawberries so that the spot where the crown joins the roots is at soil level. If you have purchased top quality, bare root, dormant plants, the roots may be quite long. Create a space in the soil both deep and wide for the roots to spread out. Plant June bearing 12 to 18” apart, all other varieties 8 to 12” apart. Mulching the soil after planting will help to retain moisture. A straw mulch is excellent if you have it. Straw is light and stays loose to allow air and water in, but prevents the surface from drying out. Sphagnum moss in a thin layer will do if you don’t have straw available to you. Just don’t use anything that will mat tightly over the soil or apply mulch so deep that it will rot in wet weather. Strawberries are perennials but all varieties need specific maintenance initially to encourage strong plants and good production. And although containers up on a deck or patio will help reduce pest problems, you may still need to through bird netting over the plants once they start fruiting. All varieties of strawberries need consistent water. Keep the soil moist as the young plants establish. As the plants grow and develop extensive root systems they will take up more water. Do not allow the soil to remain dry or your plants will wilt and production may be damaged. But do not keep the soil soaked either, strawberries do not care for waterlogged soil. While the fruit forms it is critical that you provide consistent water to keep the soil moist. In periods of excessive heat you may need to water every day since containers do dry out more quickly that an in the ground garden. Strawberries are short lived perennials. Plan to replace your strawberries every few years. In colder regions it is likely that they will not survive winter without proper protection. First year plants need to establish before you allow production. Pluck all blossoms the first year to encourage strong root systems and runners. At the end of each season, old non producing plants should be removed and allow new runner plants to establish for next season. To establish a strong plant, the first spring all blossoms should be removed through June. After July first allow blossoms to produce for fall. Only the very first set of blossoms need to be plucked to encourage a good production each year. To establish a strong plant, the first spring all blossoms should be removed through June. After July first allow blossoms to produce for fal. *Since strawberries do demand good fertility and nutrients are quickly washed out of the container when watering, additional feeding is generally necessary. Keep an eye on the vigor of your plants, you may want to feed weekly with a weak solution of organic fertilizer once flowering has begun and fruit is developing. 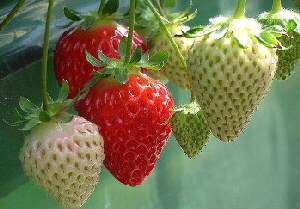 Ripe strawberries should be harvested as they ripen so as not to invite pests. Store unwashed strawberries in a cool place and wash as you use them. Before storing for winter, if several runners have set new plants you may want to thin the plantings to prevent overcrowding. Allow new plants that have well established to remain, remove small or weak new plants, and remove the oldest plants that have reduced production after the first 2 years. 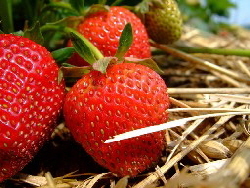 Strawberries plants in the ground are hardy enough to survive cold winters with a deep layer of straw mulch. As a matter of fact strawberries need to go dormant for best fruit productions. When grown in containers, store the containers in a cool dry place over winter. Choose a place where temperature will not fluctuate frequently over winter. The outside wall of an unheated garage or shed works well. If you store them along a heated wall they may sometimes get warm enough to break dormancy. Cover the containers with a blanket to protect them from frigid blasts when you open the garage door. Since strawberries are so cold hardy you can also store them under a deck. In northernmost regions place them along the wall of your heated house and cover with a heavy blanket. Your plants in a container are much more exposed than those in the ground, so they need a little more help getting through winter. The general rule for container plants is buy 2 zones hardier than your region if you expect them to survive winter with minimal protection. Remember that a garage can get very warm well before spring actually arrives. Your plants may try to grow even without sunshine. After temperatures have moderated and before it is warm enough to encourage growth, you should remove the containers from the garage and keep in a protected area outside. Once overnight temperatures hover around freezing put the containers back on the deck and they know what to do from there! Each spring you can add a layer of fresh compost to your large containers. If you have grown strawberries in small containers, hanging baskets, or window boxes it is best to completely replace the depleted soil. I had a hard time deciding which variety to try. I was looking for good production, sweet, super cold hard and container friendly. The two I thought might be best were Albion Everbearing and Tristan. Tristan looks to be an excellent choice for containers but may not be hardy enough for zone 4, even if protected. Albion is a bit hardier, to zone 4. The berries are good sized with good flavor. But soil moisture will have to be carefully monitored and plenty of nutrients provided. Albion also will want plenty of space to produce big berries, which is not ideal for containers but my crates are good sized.